The S.I. 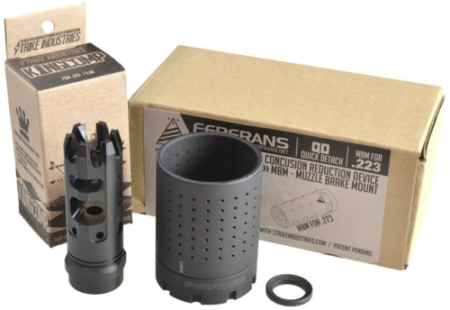 FERFRANS system comes with a choice of muzzle brake and the concussion reduction device (CRD). The Venom brake is shown here. 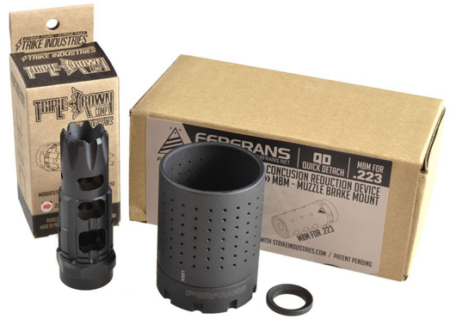 Strike Industries has released their new FERFRANS muzzle brake and concussion reduction device (CRD) combination recently. This device has enormous potential for law enforcement and civilian use alike. S.I. has produced some very practical and innovative accessories for some of the most popular firearms on the market today. Strike Industries has been in business since 2011, and in that short amount of time has been picked up by Primary Arms, LA Police Gear, and several other vendors desiring to capitalize on the successful products Strike Industries is producing. We’ll take a look at the FERFRANS system and how it can make you more tactically sound, and neighbor friendly as well. Add Strike Industries to your short list! One of the most impressive and practical accessories added to the Strike Industries list is the FERFRANS CQB muzzle brake system. 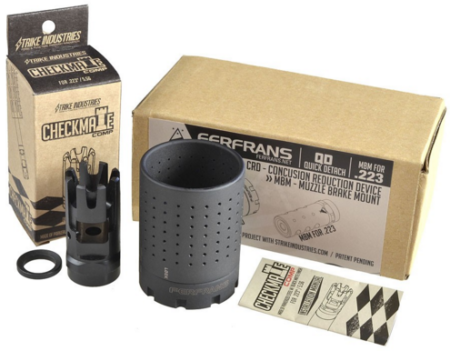 The FERFRANS CQB Modular Muzzle Brake System is a two-part system consisting of the muzzle brake and a CRD (Concussion Reduction Device) with a built-in quick attach/detach mechanism compatible with the FERFRANS and Strike Industries muzzle devices! This system combines some of the recoil reducing benefits of a variety of S.I. muzzle brakes with the incredibly advantageous sound suppressing abilities of the FERFRANS concussion reduction device (CRD). This is not a suppressor, but the effects of the FERFRANS CRD over the muzzle brake have some of the same effects. Sound and gas from the discharged cartridge are captured from behind and to the sides, and thrust forward. Tiny ports on the side of the CRD allow some gas to escape through the sides, but a highly reduced amount. This provides much of the muzzle brakes’ benefits (reduced recoil, muzzle rise), while capturing most of the gas and sound expelled (reducing sound and compression from the blast). The S.I. FERFRANS system with King Comp muzzle brake. The King Comp features a large dual chamber design, engineered to reduce felt recoil and help reduce the side concussion with the specifically angled gas ports. The King Comp also features (4) serrated prongs providing some flash suppression, designed specifically as a cross between a compensator and a muzzle brake or effective “combo” muzzle device. The Checkmate muzzle brake was designed with the battlefield in mind. The Checkmate Comp is a top quality, Parkerized steel, multifunctional muzzle instrument designed with a series of four off-set serrated angled prongs to stabilize recoil as well as reduce flash. The top port set to the right, benefits right-hand shooters with minimizing excessive climb. 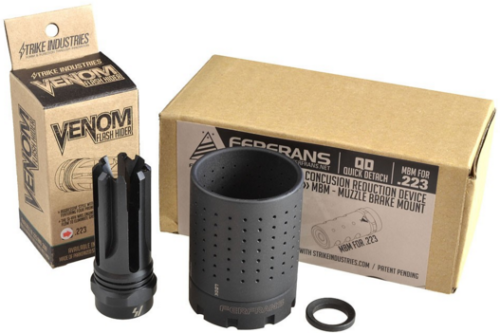 Venom takes on a traditional muzzle brake appearance with serrated prongs, and a non-continuous muzzle end. The serrations alternate between open and closed design, providing a reduction of weight, while directing expelled gases out selected avenues to avoid blinding the shooter. By extending these venting serrations, the Venom is designed to maximize recoil reduction through the release of the majority of gases expelled from the shot. Finally, the Triple Crown muzzle brake features a three-chamber design, engineered to reduce felt recoil and muzzle rise with the top gas ports. The Triple Crown features an aggressive crowned leading edge for self-defense or support for wire cutting capability. All of the S.I. muzzle brakes for the FERFRANS system can be used as a glass break option as well. The Checkmate muzzle brake is the smallest S.I. offering, and the only option that does not extend slightly past the CRD. The S.I. FERFRANS system with Triple Crown muzzle brake. Many law enforcement agencies have transitioned to AR-15 style rifles for patrol and tactical teams. The AR-15, chambered in 5.56mm or .223 cal., offers a significant advantage over pistol-chambered sub-machine guns. In addition to accuracy at distance, the power and terminal ballistics of the small rifle round are superior to pistol rounds as well. With this transition however, many tactical teams have still sought to carry short-barreled rifles (SBR) to accommodate moving through tight quarters inside of buildings, residences, and armored transport vehicles, like the Bear Cat. These SBR’s are extremely loud and bright when fired, and often cause a sensory distraction to any teammate nearby. The S.I. FERFRANS system is designed to reduce this effect, while still providing excellent function from the selected AR-15. There are small holes all around the CRD that still allow some of the muzzle brake’s benefits to be effective, but the CRD does slightly increase the amount of felt recoil and muzzle climb when attached. Because of the quick detach system, the shooter can choose what kind of muzzle setup to run to better adapt to the situations and circumstances they are facing. The one negative aspect of the FERFRANS system is that it is proprietary. I have checked with Strike Industries staff and they have advised the FERFRANS CRD is only compatible with S.I. muzzle brakes at this time. Despite this one set back, the overall system is a fantastic method to take some advantage of a muzzle brake, while reducing the felt impact from the blast on shooter’s nearby. This is particularly advantageous to law enforcement officers working in close proximity to each other, like many tactical teams are required to perform. I plan on adding the Strike Industries FERFRANS system to one of my AR-15’s in the near future.